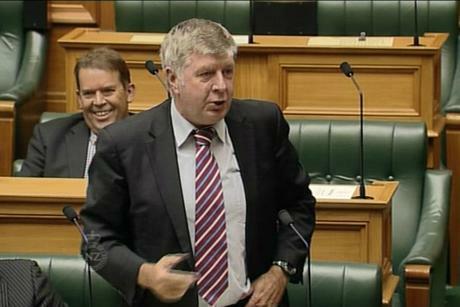 By now, most of you have probably heard the news about Pakuranga MP Maurice Williamson whose speech in support of the Marriage Amendment Bill went viral on YouTube. The reaction the the speech has caught the attention of Ellen Degeneres who invited him to appear on her show! Maurice is donating his appearance fee to a charity and Rainbow Youth are putting our best foot forward to be that chosen charity. Over the past few days, as we as an organisation have continued to discuss the passing of the Marriage Amenment Bill and the impact it will have on our country, your speech has been making an impact on the world. Fifteen Million hits on youtube is enough to have any young, techno-savvy kid weeping with envy! It truly is an impressive feat, and stands as a testament to the truths you conveyed in your speech that it resonated with people all over the world. Last Wednesday evening a group of queer and trans* youth gathered at Rainbow Youth headquarters to watch the third reading of the Marriage Equality Bill. We laughed and cried and made our own running commentary through the speeches while eating pizza and chatting about changing the world. As we listened, the words of each speaker resonated around the crowded room. The “big, gay rainbow” you mentioned stretching over Pakuranga was seen by some of our youth group members from your electorate that same day. The fourteen year old kid Grant Robinson talked about – he was in our midst, watching and feeling that hope which Grant described. When Mojo Mathers talked about seeing her daughter go to her school formal with her girlfriend, there were daughters and sons sitting at Rainbow Youth, thinking about their own formals and wanting to be treated the same as their siblings. When the votes were read out, and Parliament broke out into a Waiata, everyone watcing at Rainbow Youth felt a collective sense of pride and belonging. You, and all those who have supported this bill, have contributed to the work of our organisation in ways that go far beyond just giving speeches – you allowed all of us to feel equal in the eyes of the law. To feel valued and included by our country. To then have you asked to go on The Ellen DeGenres Show is just something else! Ellen is someone who has also given great inspiration to millions of queer and trans* youth, including members of Rainbow Youth. Through her work against youth suicide and bullying, as well as her own monumental coming out, Ellen is pretty much as cool as they come. So, it would just be the cherry on top of our marriage equality cake if you were to support Rainbow Youth through your appearance. Last Wednesday evening was a huge movement forward for us, but there is just so much more work to be done and as a youth-run, youth-led charity we are always seeking support in the form of donations and awareness-raising. – We are a non-partisan youth run, youth led charity providing support, information, advocacy and education for queer and trans* young people in Aotearoa New Zealand. – We’ve been delivering education workshops for schools, community organisations and tertiary institutions for the last 10 years, looking at sexual orientation and gender identity issues, the impact of homophobia and how to create a safer school environment for all students. – We initiated and continue to work on our grass roots and internationally recognised awareness & fundraising campaign WTFNZ. All of this is done on the sniff of an oily rag. That pot of gold at the end of the rainbow isn’t coming to us any time soon. Our staff, our board and our volunteers work tirelessly to make things happen. Like your speech, your support would continue to help us in so many ways. We run a drop in centre at 281 Karangahape Road and we would be honoured if you found the time to pop in and say hello. We are also always looking for inspirational voices to be heard through our Rainbow Youth and Curious websites and a interview with you would be a particularly special voice to us. Once again, thank you for your speech. But mostly, thank you for your honesty. You put the truth as plainly as can be and it has made people sit up and listen. We hope you consider us as part of the message you want to continue to promote, and look forward to hearing from you about your upcoming trip to appear on Ellen.